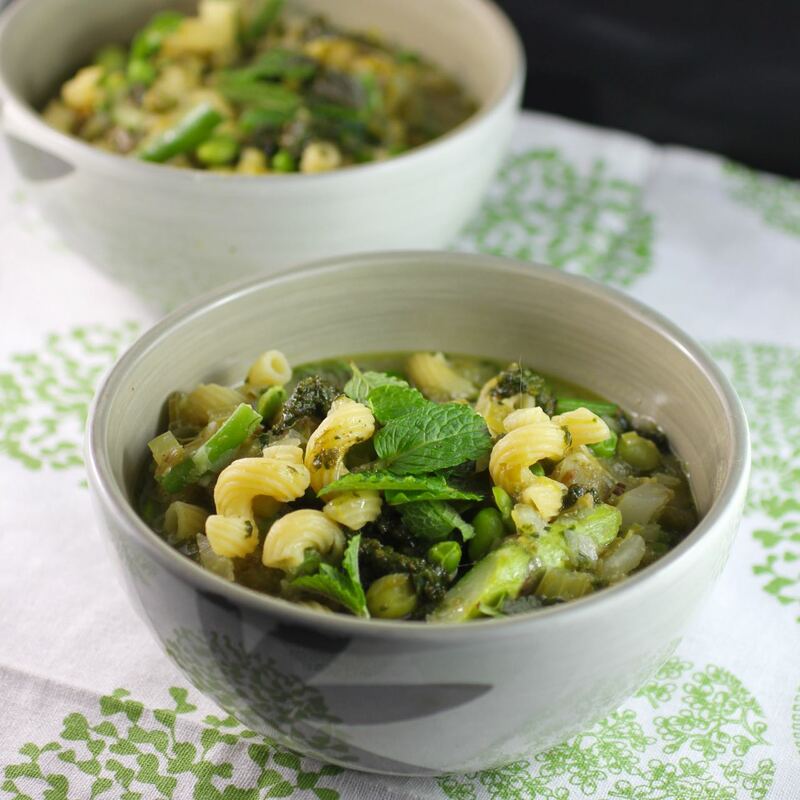 Green Gourmet Giraffe: Alice Hart's Summer Minestrone - in Spring! It is a rare treat to have a night of cooking with no deadlines, no small girl to distract me, no husband waiting with rumbling belly. I didn't plan it. Fate was just feeling kind this week! It just so happened that when we asked my mum to have Sylvia overnight while we see Joan Baez tonight, that she was in town yesterday and took Sylvia for two nights. I had seen a Spring Leek Minestrone in the latest Coles Magazine. It was a lovely green but had meat in it so I knew I needed to fiddle with the recipe. 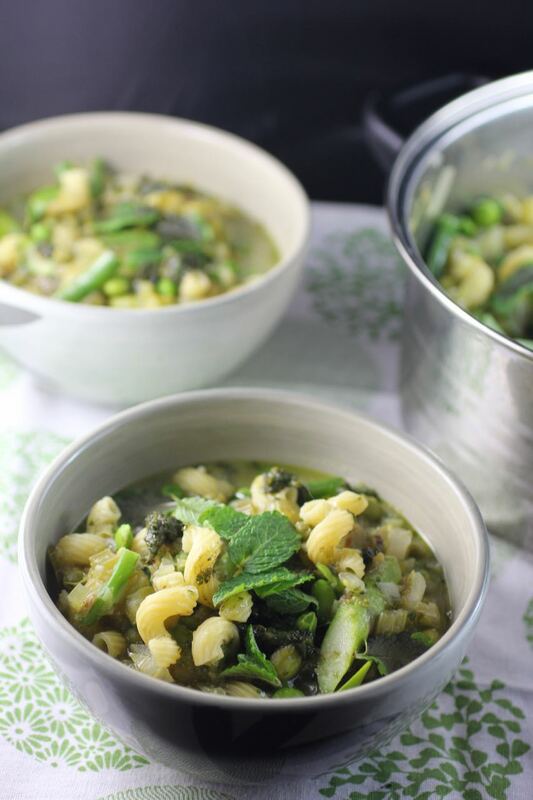 Fortunately it brought to mind a gorgeous green Summer Minestrone in Alice Hart's Vegetarian that I swoon over every time I browse the cookbook. I mostly followed Alice Hart but brought in some pasta from the Coles recipe and altered the vegies a little depending upon what I had. I really loved the texture of the soup which was cooked by halving the green vegies to simmer one batch to melting tenderness and then adding the other batch just at the end so they kept their colour and a slight toothsomeness. The soup would be great without pasta if you wanted it gluten free. I would either use smaller pasta next time, like risoni or a smaller macaroni, or a grain like rice or quinoa. I often chop vegies as I cook a stew but as greens need to be ready on time to retain the colour, I made sure I prepared all the vegies before I started cooking. I used frozen broad beans and peas but was happy to welcome fresh asparagus into my kitchen now it is Spring. I love reading food writing. Nigella Lawson's prose is such a joy. Alice Hart's cookbook is really beautiful to read but I did feel she went a little far in claiming that if you keep the soup to the next day you will find that "the vegetables may not be as sprightly but will have gained wisdom and character". Though perhaps E might appreciate some wisdom from his vegetables, given that he ate his soup with a fork. I am delighted to have finally made this soup. It was every bit as wonderful as it looked. Happily I also had time to set up the light box last night to photograph it! I would like to stick around telling you more but I have a shower to scrub, forms to fill out and muesli to bake while the house is quiet! 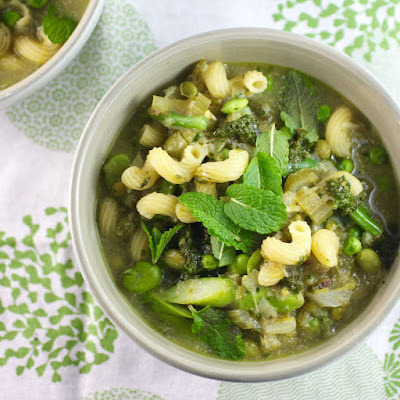 I am sending this minestrone to Meat Free Mondays and Healthy Vegan Fridays. Heat olive oil over medium high heat in a large saucepan. Fry garlic, leek, celery and fennel for about 10 minutes until soft, stirring frequently. 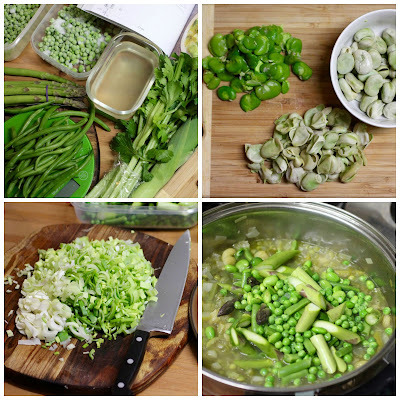 Add half the asparagus, peas, broad beans, green beans, edamame with all the water, salt, stock powder and vinegar. Bring to the boil and simmer for 20 minutes. Add pasta and simmer 5 minutes. Add remaining greens and simmer a final 5 minutes. Check pasta is cooked. Stir in yoghurt, mint and black pepper. Ladle into soup bowls and swirl in some pesto. Eat hot, warm or cool. It can be made a day ahead or leftover kept in the fridge overnight. Fresh vegies are best but I used frozen peas, edamame and broad beans. I weighed 200g of the broad beans in their grey skins and then skinned them before adding to the soup. I didn't have stock so I added a mixture of stock powder and salt but if I had a good vegie stock I would use that and I might even reduce the stock slightly as E said it was too watery for him. I used a macaroni pasta but would use a smaller one next time or grains like rice or quinoa (especially if I wanted it gluten free). I used yoghurt instead of cream. If you wanted to make it vegan you could use vegan yoghurt, cashew cream or even a splash of vegan milk and a little less stock. Beautiful colours and such lovely ingredients-- makes me regret passing over the asparagus and fennel at new Coles today! That's what we call the new Coles at Coburg Village, I am a sucker for live baking action in the bakery there! Oh I just realised I should probably call it Coles New World, ha! It looks so fresh and green! "The soup would be great without pasta if you wanted it gluten free." The pictures really are gorgeous. I'm so jealous you're going into spring - autumn flavours are good too, but there's nothing nicer than proper asparagus!